A diagnosis of cancer in a family impacts every single member of the household in different ways. With that in mind, Wellspring recently developed the Parents’ and Children’s Program in an effort to provide support to children who live in a household where one of the parents or guardians has cancer. 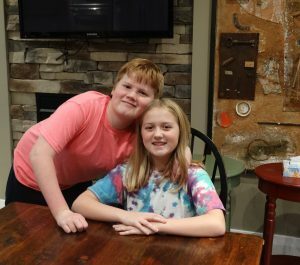 Well on the Way recently had the pleasure of talking with two young members, Evan, 13 and Claire, 11, who attended the program along with their parents, at Wellspring Birmingham Gilgan House. Learning coping strategies is a big part of the program experience. Prior to participating in the sessions, Evan said that with his mother’s cancer on his mind, he often cried when something upset him. But after attending the 8-weeks of sessions, he says he learned how to mentally process things, and talk about his feelings. Claire on the other hand, learned that journaling was a good way for her to express her feelings. Click here to register for the upcoming Children’s and Parents’ program at Wellspring Birmingham Gilgan House (2545 Sixth Line, Oakville, ON, L6H 7V9). Thursdays, January 31 – March 21, 2019, 5:30 – 7:30 p.m.